Aside from updates below, we also feature many updates on our facebook page. Our facebook page is updated frequently and features photos from recent and past projects (including some photos/projects not featured on this website); as well news about upcoming events, links to useful information and a chance for you to participate in our timber framing community. 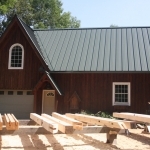 This July 26th and 27th, 2014, we will be hosting an open house at our shop and a nearby finished timber frame home. If you have ever wanted to see our finely crafted timber frames first hand this is an excellent opportunity. The informal open house will be available on Saturday and Sunday from 9 am to 3 pm. 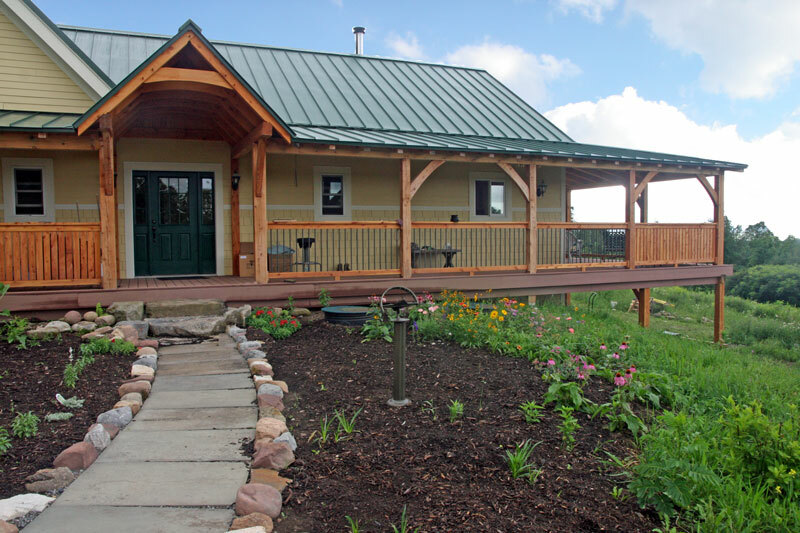 The shop and home demonstrated two different types of timber framing styles as well as the different types of timber species that can be used. 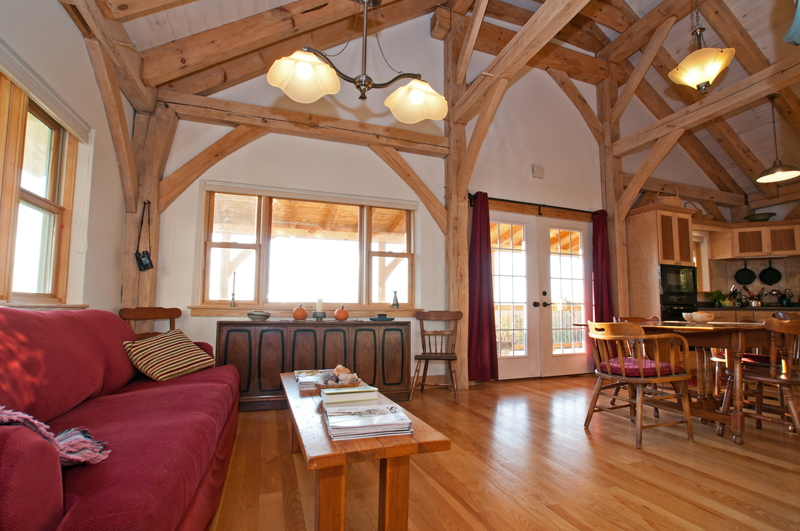 As many have told us, pictures just don’t convey the warmth, strength and coziness of being inside a timber frame so why not see for yourself. 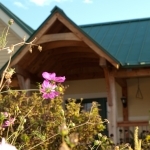 We will be available to answer any questions you may have about timber frame construction and how you can easily incorporate it into your dream home or upcoming project. You can also get updates regarding this event on our Facebook Fan Page. Or follow us on Twitter and receive instant updates for the tour, open house, and lots of other unique content. After completing a busy spring with a variety of trusses we have begun working on the frame we hoped to feature for a the spring hand raising. So now it is the an early summer raising but a hand raising nonetheless. The rasing date is June 23rd and starts around 9. Following a short safety and planning meeting with all the attendees we will get right into it and raise the first bent. As of now the plan on how to exactly raise the frame will depend on the number of participants so if you plan to attend please let us know on the event page. Signing up there will also allow you to be notified of any developing details (cancelation due to weather, change of times, etc.) Coincidentally the rain date will be the following saturday, June 30th. 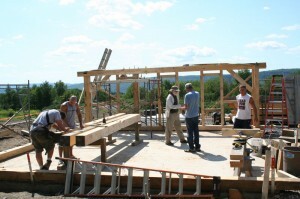 The project is a 18′ by 16′ Timber Frame addition that is very near to our shop. Though the project may be small in square footage it is big on details. 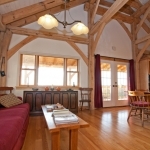 Calling all Timber Frame Enthusiasts! 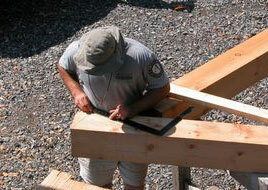 An aspiring timber framer must learn about the strength and characteristics of wood if they hope to master the craft. The characteristics of wood play a role in the decision process at each step, from general strength characteristics in the designing and engineering of the frame to final weight calculations during the raising and installation of the frame. We will leave a discussion of the design values, to the tomes of books and plethora of characteristic and engineering tables dedicated to this topic. 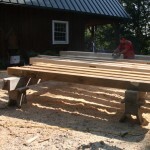 Rather the information here is concerned with the characteristics of wood that go into the decision process of the timber framer where it concerns the timber placement and more specifically layout and cutting of joinery. 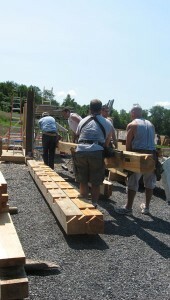 On June 25th, we will hold another live timber framing demonstration at our shop. This is a second opportunity for those who missed our first demonstration on how we layout and cut the joinery that is the heart and soul of a timber frame. 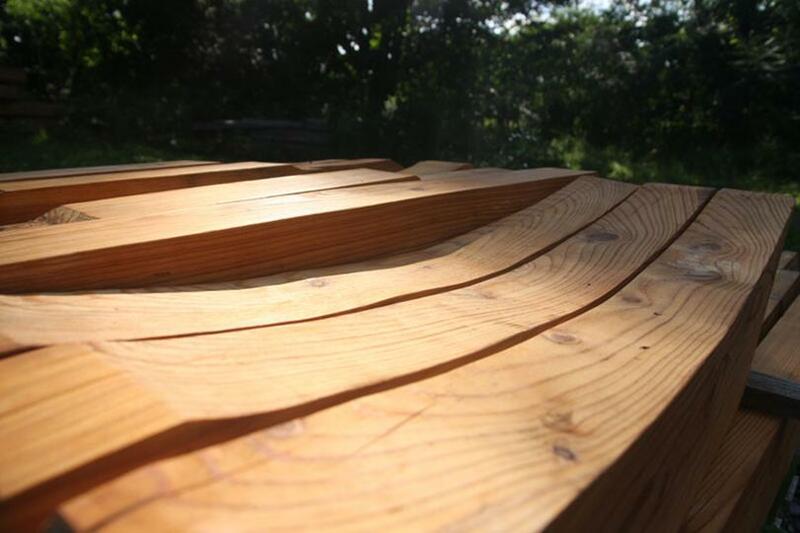 The demonstration will focus on the process of timber selection, layout and how we use a combination of power and hand tools to quickly, accurately and efficiently cut joinery. 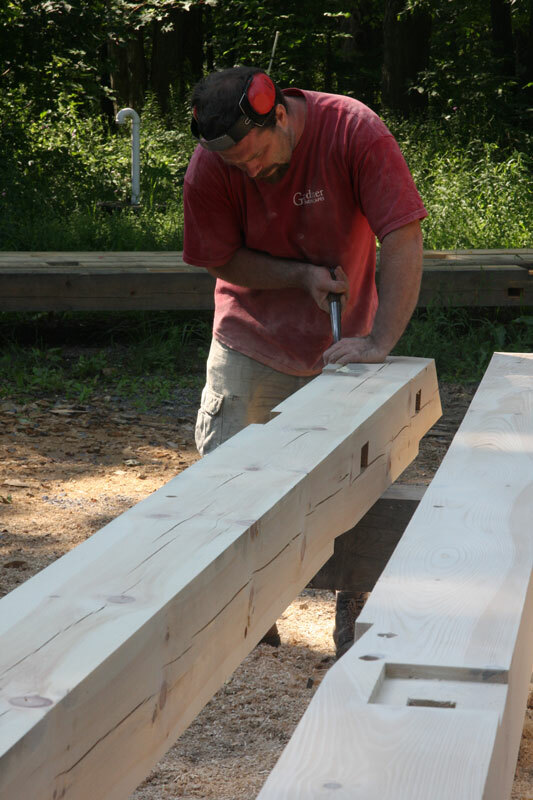 Part academic but mostly hands on, we will be also explaining; how and why we use Square Rule Joinery, what housings and reference faces are, how we grade and select timbers for both strength and appearance, as well as the characteristics of wood that determine joint placement and type. For more details including location, time and an useful event email notification sign-up please visit the event page. 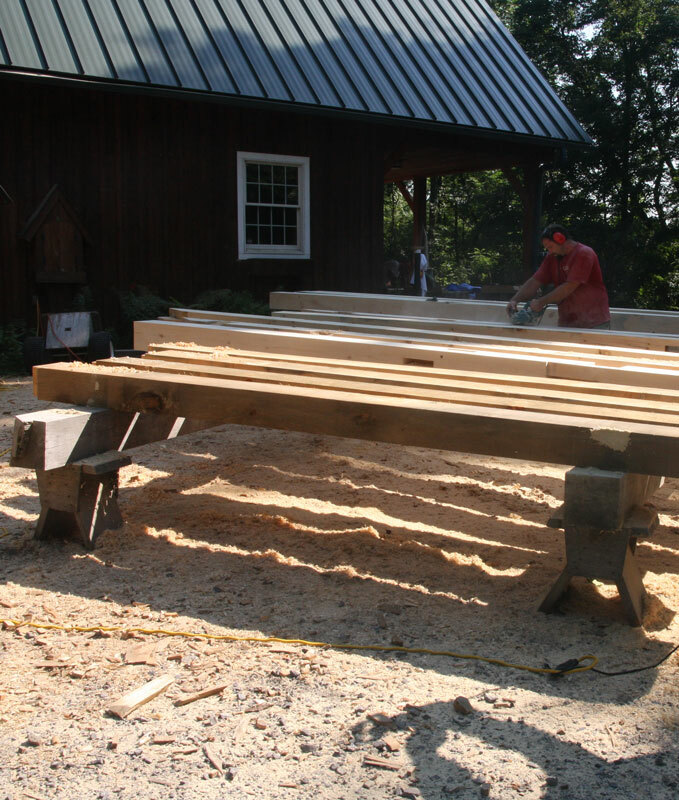 The mainstay of our business is undoubtedly timber frame homes but outdoor frames are also high on the list of frames we love to build. Outdoor frames, such as pergolas or pavilions, offer a freedom of form and function that is unrestrained by housing conventions and associated utilities/systems. In the outdoor setting the frame typically stands alone or is used to accentuate natural features. 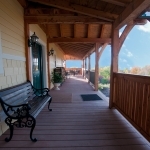 When it comes to pergolas there are many options in both designs and materials and while some of these products offer some advantages over each other, none offers what a fully timber framed pergolas can. 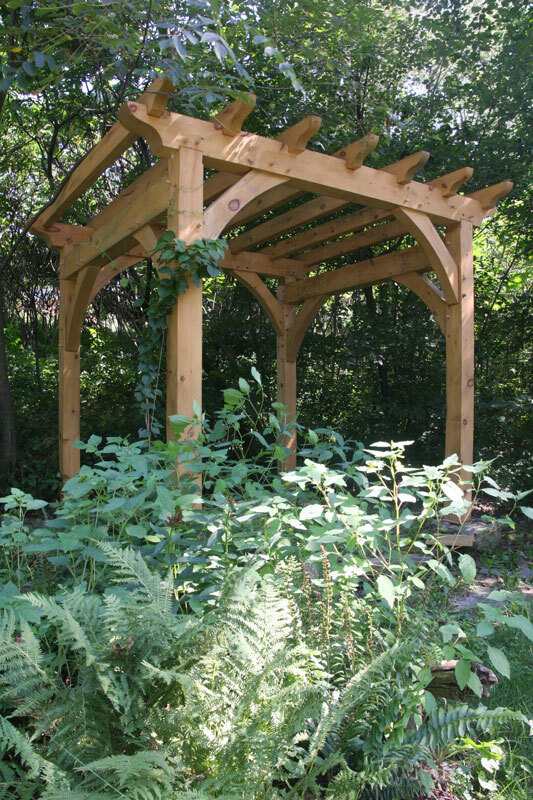 One of the main advantages of timber framed pergolas, and for that matter all timber frame structures, is their unsurpassed strength and durability. 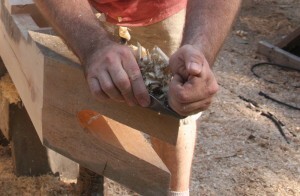 Heavy timbers connected with wooden joinery become interlocked and the whole is much stronger than the sum of its parts. At New Heritage Woodworking we use naturally rot resistant larch timbers, which won’t leach harmful chemicals and are benign to the environment. 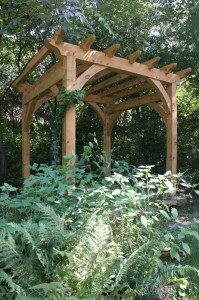 Heavy timber pergolas don’t have that rickety/spindly look that some other designs/materials have. Perhaps above all the level of craftsmanship that goes into every one of our timber frames will enhance your garden/outdoor living space. 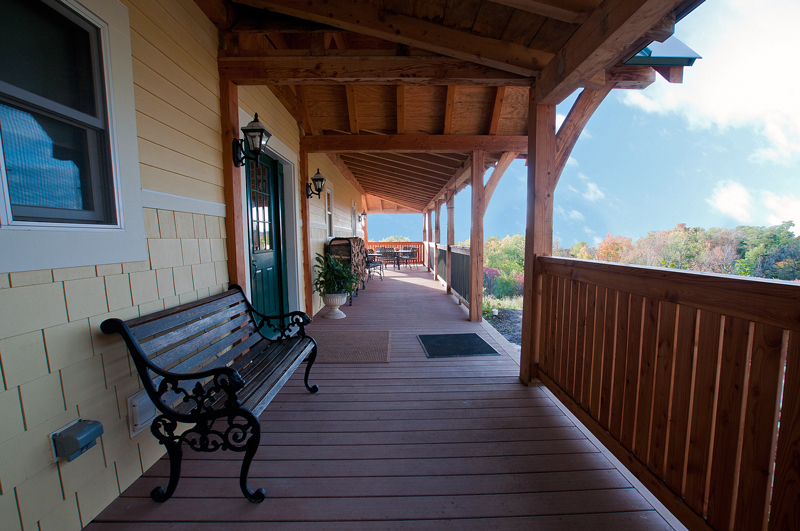 You will find that patios, decks, walkways and outdoor kitchens are all accentuated and enhanced by these beautiful wood structures. Come watch the wood chips fly, on April 30th, when we put on a live timber framing demonstration at our woodworking shop. 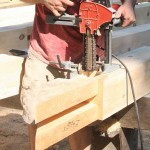 This is a great chance to see how we layout and cut the joinery that is the heart and soul of a timber frame. Using an assortment of power and hand tools we will demonstrate how we can not only produce strong and durable joints but also how they are produced efficiently and accurately. 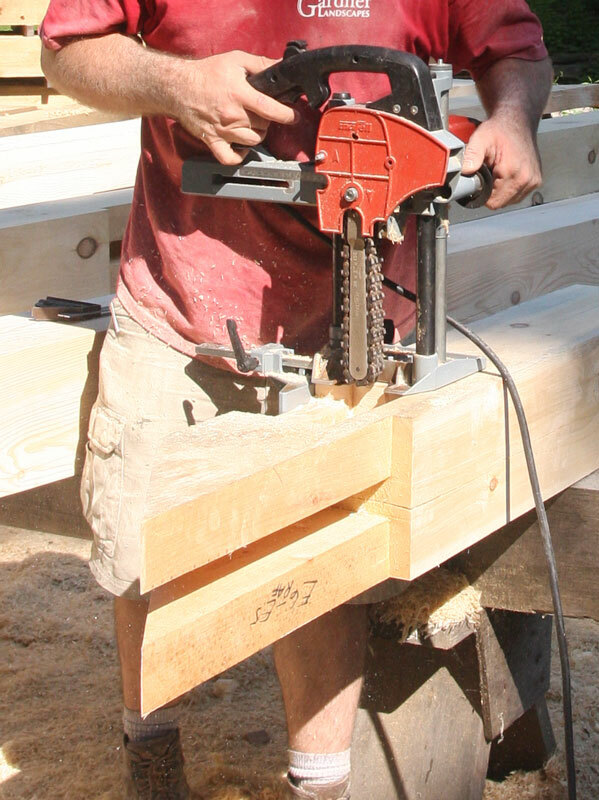 Part academic but mostly hands on, we will be also explaining; how and why we use Square Rule Joinery, what housings and reference faces are, how we grade and select timbers for both strength and appearance, as well as the characteristics of wood that determine joint placement and type. We will give an overview of hand tool usage/sharpening and of course how we use our monster 16 inch Circular Saw and Chain Mortiser. 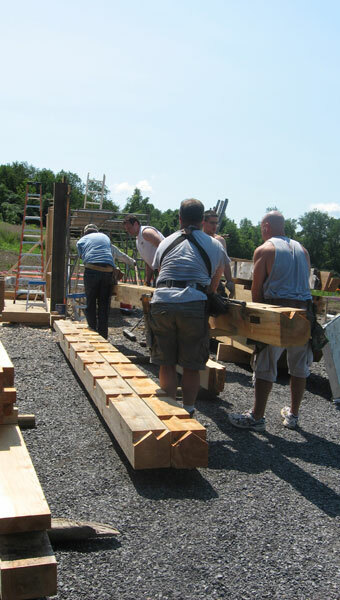 In all likelihood additional gems of information regarding the art and craft of timber framing will be discussed/revealed so we hope you can join us for this new and informative event. The event will begin at 9 with the demonstration starting at 9:30. Parking space will be limited so please carpool if possible. Find more details on the Event’s page. The demonstration will be outdoors and as such weather dependent. Rain date will May 14th. We suggest that if you are planning to attend that you fill out the form below so that we may confirm by email on the day of the event. You can also get updates regarding this event on our Facebook Fan Page. Or follow us on Twitter and receive instant updates for the demonstration and lots of other unique content. 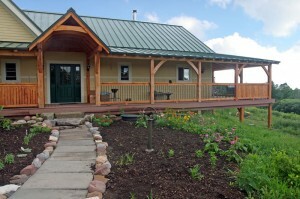 Our timber frame home tour is next weekend! Spring is finally officially here! 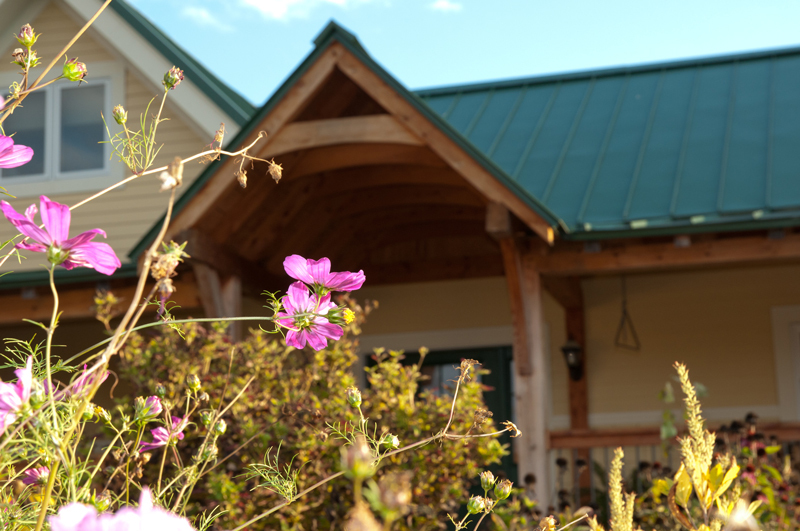 Come help us welcome the sun and thaw at our timber frame home tour next weekend; March 26th. Not only can you tour our workshop but also get an upclose look at one of our completed projects. Details can be found at the event’s page. Larch is unique in the forest in that it is deciduous conifer. 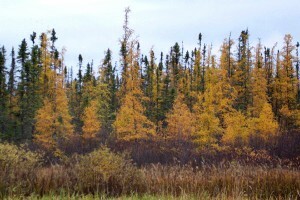 During the fall foliage season the normally bright green needles turn yellow and fall. 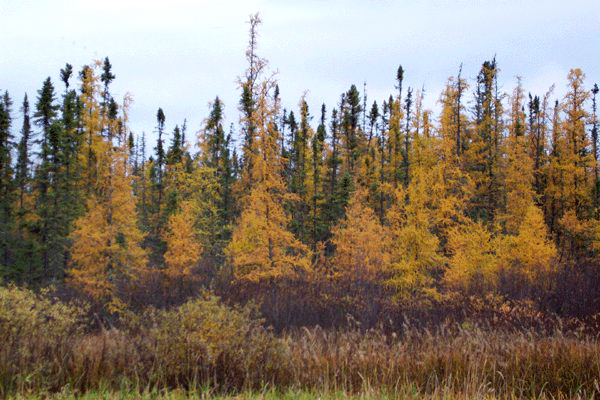 Typically found in cool swampy areas the larch tree can grow from 40 to 80 feet tall. The species range is typical of the Canadian boreal forest but ranges into New York and is found mostly amongst Black Spruce and Balsam Firs. A shade intolerant tree it grows faster than any other conifer making it productive for commercial use. It is considered a pioneer species in that it gets quickly established especially after fires and in filled in lake bogs. 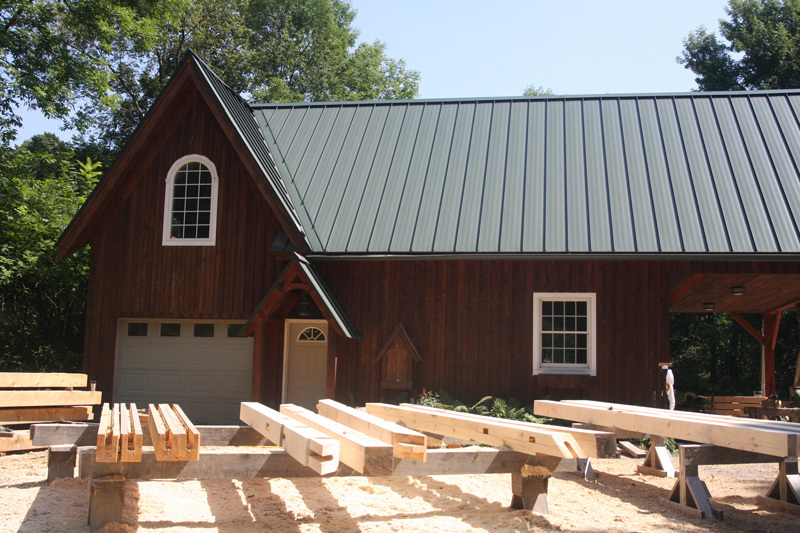 Considered a tough and durable lumber species Larch has a reddish quality similar to Cedar. When fresh from the mill it can be dented with a fingernail but becomes denser and harder over time. It is a highly reactive species so when it is dried too quickly then twist and warp are a concern. Consequently we don’t recommend it for interior use where moisture loss can be sudden and prolonged; compared to outdoor use. Its natural rot resistance makes it an ideal outdoor wood and excellent substitute for pressure treated wood. If left untreated the wood turns a deep red before slowly weathering to gray. If oiled after it reaches its deep red, the warmth and deep tones can be preserved for years before it needs to be re-oiled. Its special growing conditions means its availability is limited at times so lead times for timber orders can vary. One of the services we offer our clients is three-dimensional design. Believe it or not we are actually able to design our timber frames in 3D faster than if we were to produce traditional 2D drawings. By designing in 3D we are able to see spatial relationships and potential design conflicts easily and early on in the design process. Besides the advantage this offers us in streamlining fabrication and production it also translates to construction savings by avoiding project delays and costly change orders. We offer basic schematic 3D designs free as a part of our initial consultations and before entering into a formal preconstruction design agreement. All we need to produce these drawings is a rough floor plan, which we are more than happy to assist you in producing. Join our other subscribers and never miss an update!